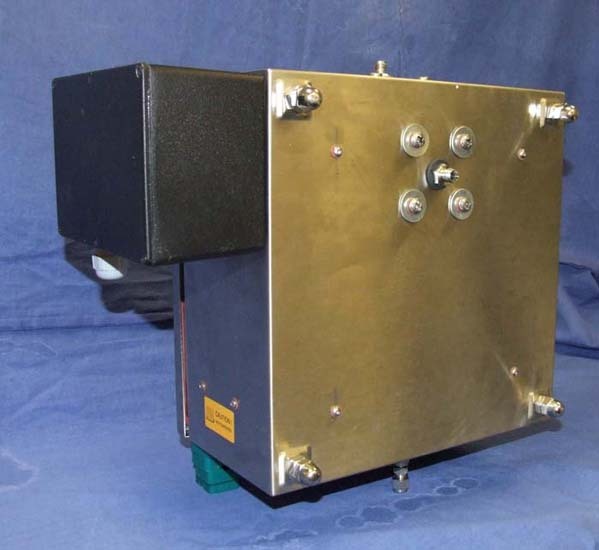 "applying the power of atomic fluorescence"
The P S Analytical range of mercury continuous emissions monitors (CEMs) is designed to handle all types of industrial and research applications. The CEM is based on modules (click here) which allow the systems be customised to specific user requirements. The majority of CEMs fall into three broad categories which can be summarised as general purpose, dedicated monitoring or compact instruments. It is estimated that over half the mercury emissions to the atmosphere are caused by anthropogenic activities. (Further information is available from the EPA website). The majority are caused by the burning of fossil fuels for power generation but significant amounts are also produced from waste incineration, crematorium and smelters. Mercury is emitted from combustion processes in three forms: (1) elemental mercury Hg0, (2) oxidised mercury HgII and (3) particulate mercury HgP. The oxidised and particulate forms of mercury have a relatively short atmospheric residence time and affect the area closer to their source whereas elemental mercury can stay in the atmosphere for times varying from 8 to 16 months and therefore can be wind transported over vast distances with consequent global environmental impact. 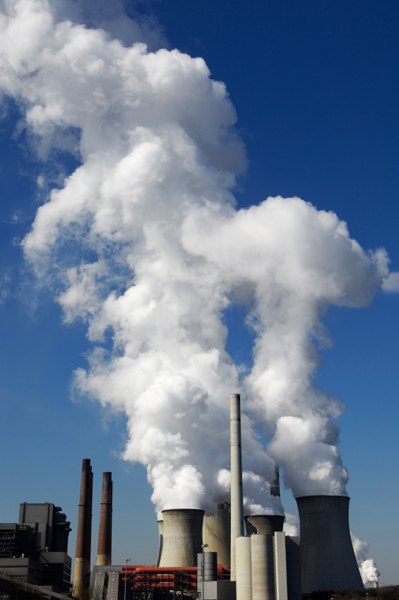 Mercury continuous emissions monitors are increasingly used at any industrial plant which uses combustion technology and produces significant mercury emissions. Full scale plant systems need to be able to handle harsh operating conditions with minimal operator attention. Conversely lab scale systems have to be able to handle rapid changes in operating conditions set up which requires more operator intervention. Pilot plants can vary in size from just above lab scale to full scale plants so analyser requirements can vary greatly. We describe systems for full scale plants here with recommendations for pilot plant and lab systems. The operational systems consist of Mercury CEM analyser with an appropriate probe/sample conditioning system.. Since 1996 PS Analytical has sold in excess of 50 PSA CEMs for Mercury Analysis which have been used to test in excess of 250 power plants worldwide. These are installed on sites using various fuel types producing different stack gas compositions. They are also located within plants to measure the different processes including upstream and downstream of particulate removal devices (ESP, bag-houses), deNOx units, wet/dry scrubbers and flue gas. More than 90% of these installations use the Hg CEM for speciation measurements to establish the efficiency of the control technology. The PSA mercury CEM contains the PSA 10.525 Sir Galahad mercury monitor. Mercury vapour generator, stream selector valves, industrial PC and controllers all mounted in an enclosed monitor cabinet with calibration kit. Linear range of up to 3000µg/m3 (without dilution). They can be configured to any specific customer requirement although certain configurations are frequently requested, these are described below. The PSA 50.100 dedicated online CEM analysers for measuring total mercury stack emissions and can be used as a dedicated compliance monitor. The PSA 10.665 is the standard CEM analyser for measuring both total mercury and speciation levels from mercury removal unit’s outlets and /or inlets. The unit can be supplied configured for connection to multiple sample points with speciation options. The PSA 10.680 CEM analyser is designed to give the power of the PSA 10.665 analyser, in a portable compact housing, which allows it to be used as a general purpose monitor, as well as for pilot plant studies. The choice of probe and /or sample conditioner will depend on the requirements of the analyst and the reactivity and volume of ash in the emissions. In order to meet all applications, PSA offer a range of Probes, Sample Conditioners and Conditioning Probes. Probes with appropriate sample conditioners are used for full scale plant and plant testing operations where large quantities of hot reactive ash are common. Conditioning probes ie probes with built in sample conditioner are usually installed in bench/ research scale operations where virtually no ash is present. All probes need to be fitted with an appropriate stinger. The probe, fitted with an appropriate stinger is used to extract a representative sample of gas from the centre of the emissions passing out through the exhaust stack. 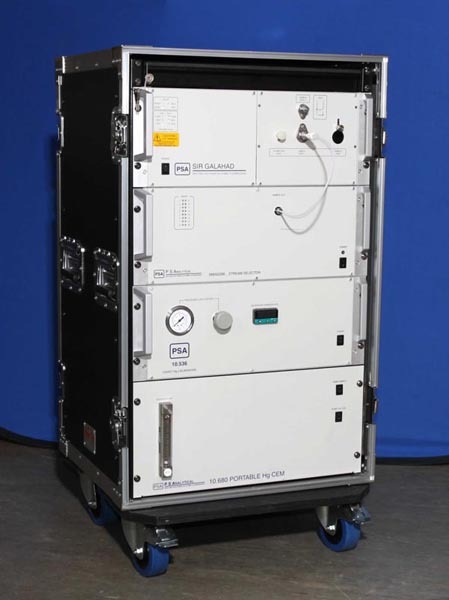 The PSA 50.125 Inertial dilution probe is used upstream of particle control devices where high quantities of ash and high temperatures are normal. An optional mercuric chloride generator can be fitted to the probe for recovery and validation studies. The basic principle of operation of the inertial filter is to accelerate the particulate material contained in the process gas in a vector direction with sufficient velocity to prevent the particles from sticking to the walls of the sampling tube and extract a gas sample to be transported to a gas analsyer. 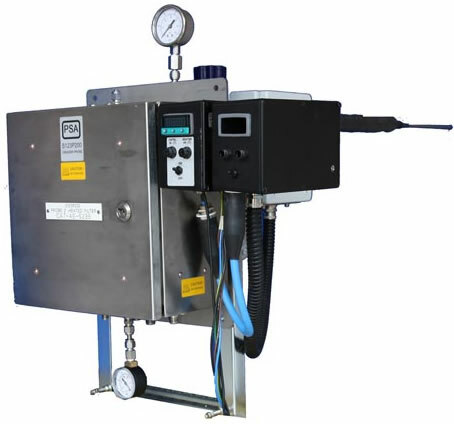 The inertial filter operates by accelerating the particulate material contained in the process gas in a vector direction with sufficient velocity to prevent the particles from sticking to the walls of the sampling tube and then a gas sample is extracted and transported to the analyser. Is designed for use on utility and other stacks and can be used anywhere downstream of particulate control devices (where the ash content is low). A continuous flow of sample is drawn though the heated stinger and filtered by an air eductor. A sub sample is removed from this flow through a critical orifice and filter by an air powered eductor pump. This arrangement produces a stable dilution of the sample and provides a rapid delivery of the diluted sample gas to the analyser. The dilution rate can be verified using an independent calibration gas or more specifically by use with a PSA Mercury vapour generator. Sample conditioners are selected depending on the analysis requirement. Sample conditioners are used either to measure the total mercury present in the emissions or to measure oxidised mercury in addition to total mercury. The unit can be mounted close to the probe or next to the analyser depending on the amount of access at the sampling point. 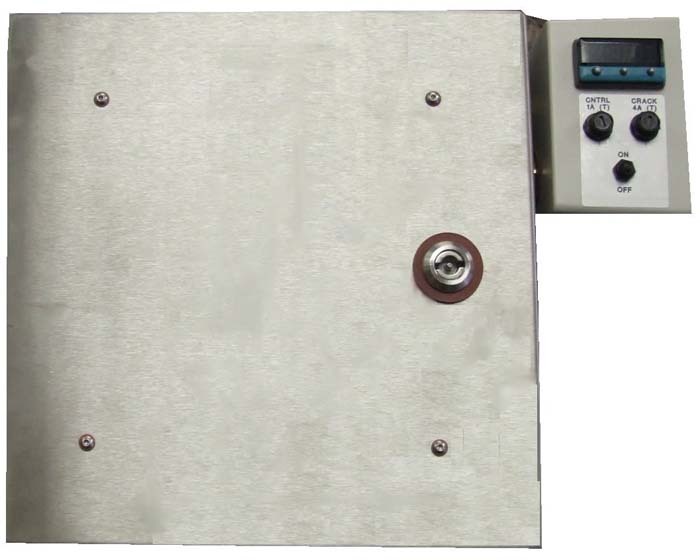 PSA S123C200 Speciation Conditioner this is a speciation conditioning module that receives hot filtered diluted gas under a positive flow from the sample probe through a heated Teflon transfer line. A high flow through a primary vent ensures that a representative sample is obtained with no mercury losses. The sample taken from this flow is split, with one part passing over a catalytic converter which converts all the mercury to elemental mercury, the other part of the sample passing over a selective adsorbent which removes oxidised mercury and allowing the elemental mercury to pass. These two flows of elemental mercury are transferred to the analyser for measurement. This conditioner allows the user to measure speciation of total mercury, elemental mercury and oxidised mercury (by difference) in the same sample. 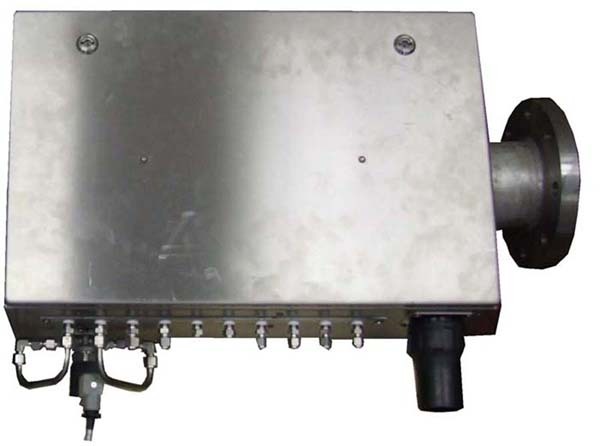 PSA S123C300 Conditioner for total mercury measurement this is a conditioning module that receives hot filtered diluted gas under a positive flow from the sample probe through a heated Teflon transfer line. A high flow through a primary vent ensures that a representative sample is obtained with no mercury losses. The sample taken from this flow passes over the catalytic converter where all the mercury is converted to elemental mercury and is transferred to the analyser for measurement. This conditioner allows the user to monitor the total mercury content of the emissions. Externally the both units look similar. The PSA S123P100 and PSA S123P200 range of Dilution Probes has been developed for the determination of mercury in flue gas media where oxidised mercury may be present. They operate as probes with built in sample conditioners. They are principally intended for use with bench-scale, pilot-scale or very small scale processes where a limited amount of space is available. Where appreciable levels of particulate matter are present other probes in the P S Analytical range may be more appropriate. The unit operates by drawing the hot gas through a filter followed by a catalytic converter where all the mercury is converted to elemental mercury. Dilution gas is used to feed the eductor pump of the dilution cross which pulls the converted sample through an orifice at sonic conditions. The dilution rate is usually 40:1 although other options are available. The diluted sample is transferred to the analyser where the mercury is measured. The dilution rate can be verified using the PSA mercury vapour generators. The use of the dilution overcomes condensation of acid gases and water which removes the need for expensive heated sample lines. The unit operates by drawing the hot gas through a filter to the dilution cross. Dilution gas is used to feed the eductor pump of the dilution cross which pulls the converted sample through an orifice at sonic conditions. The usual dilution rate is 40:1, other options are also available. The diluted sample is split between a sample bypass where the gases are vented, the catalyst tube and the adsorption tube. The streams from the catalyst tube and adsorption tube are transferred to the analyser where the mercury in each is measured sequentially. The dilution rate can be verified using PSA mercury generators. This arrangement prolongs the catalyst and adsorbent life. The use of the dilution overcomes condensation of acid gases and water which removes the need for expensive heated sample lines. It is particularly useful when analysing streams with very high concentrations of mercury. Heated Teflon sample lines are used to transfer the gas sample from the probe to the sample conditioning unit. The length required must always be stated. If you have any specific questions, would like to discuss your individual requirements or need more detailed information on any of the above products please return the Information Request Form.